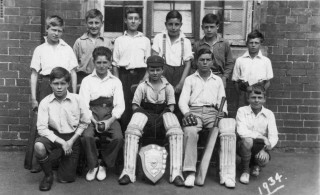 Bottesford School 1934 cricket team by the school building. Mrs Ada Bond has kindly contributed this picture of the Bottesford School cricket team of 1934, which includes her late brother Ralph Bateson. The boys are as follows. Back row (L to R): Walter Stanley, David Bolland, Henson, Dennis Kirk, Porter, Moreley (from Redmile). Front row (L to R): Hugh Miller, Ron Donger, Ralph Gilbert, Alan Abbott and Ralph Bateson. This page was added on 02/09/2009. What a lovely way to see Grandad (David Bolland) as a boy, but of course most will remember him as the village postie!! I worked with Ralph (Shorty) Gilbert at the AVRO Aircraft Repair Works at Langar in the late 1940’s/early 1950’s. When I started as an apprentice, Ralph had already served in the Fleet Air Arm. I have fond memories of Ralph, particularly, of playing cricket at the back of one of the aircraft hangars, with the stumps marked on the hangar door. Ralph was an accomplished batsman at that time playing for Whatton and Aslockton. I also knew Ralph Bateson who married Glenys Coy a girl from Harby. Subsequently, Ralph played cricket for Harby. In the 1960’s Ralph and Glenys plus family emigrated to Australia, where, sadly Ralph passed away. Glenys now lives in Tasmania.